The Norwolf Xcelink™ is the ultimate answer for gaining access where standard pneumatic multipliers are too tall or bulky to fit application. The Norwolf Xcelink™ is essentially a Missing Link™ with the ability to turn continuously. There are two available styles. 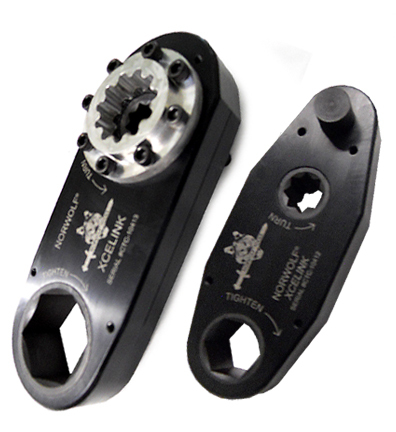 The standard style has a sliding pin with which to react with any standard pneumatic torque wrench. The hub style has a specific splined hub to match the input tool of choice. All hubs can be interchanged for added versatility. • 3:1 or 4:1 ratios. • Totally enclosed aircraft aluminum housing. • Available in two styles, pin or hub reaction. • Continuous rotation for use with any pneumatic or electric wrench. • Available in special configurations. • Gearless internal design offers long service life.